Strict liability, negligence, negligence per se, and breach of warranty of fitness claims were among those dismissed by the MDL court in Louisiana. However, the court rejected as premature dismissal of claims on statute of limitations grounds. Claims against a drywall distributor brought by homeowners whose homes were allegedly damaged by defective drywall were either timely made or may be timely pursuant to their respective state’s discovery rules, according to a ruling by a federal district court in Louisiana overseeing a multidistrict litigation concerning drywall defect claims. Consequently, the court denied a motion to dismiss these claims based upon statute of limitations grounds. Louisiana homeowners’ claims based on breach of the warranty against redhibitory defects survived a motion to dismiss, as well as non-Louisiana homeowners’ claims based in negligence, negligence per se, strict liability, and unjust enrichment. However, the court dismissed with prejudice Louisiana homeowners’ claims for negligence, negligence per se, strict liability, private nuisance, breach of the warranty of fitness, and unjust enrichment, as well as claims pursuant to various states’ consumer protection and private nuisance laws. The distributor’s motions based on lack of jurisdiction and improper service were denied because they had been ruled upon previously by the court (In re: Chinese-Manufactured Drywall Products Liability Litigation, March 6, 2019, Fallon, E.). From 2004 through 2006, drywall manufactured in China was used to construct and refurbish homes in coastal areas of the U.S. Sometime after this drywall was installed, homeowners noticed foul-smelling odors; the corrosion of metal wiring, surfaces, and objects; and the breaking down of their electrical home appliances. Many also began to complain of various physical afflictions. Suits were filed in state and federal courts against a number of entities involved in the production, sale and installation of the drywall. All federal cases involving Chinese-manufactured drywall were consolidated for pretrial proceedings. One of the drywall distributors sued by homeowners in this matter was Beijing New Building Materials Public Limited Company (BNBM). BNBM moved to dismiss claiming it was not properly served, it was not subject to jurisdiction in Louisiana, the complaint was time barred, and the complaint failed to state a claim. Statute of limitations. After the court summarily denied BNBM’s process and jurisdictional arguments which had previously been litigated and denied, the court considered and denied BNBM’s statute of limitations motion. After a detailed discussion of choice of law principles, the effect of class action lawsuits on statutes of limitations (pursuant to American Pipe & Construction Co. v. Utah, 414 U.S. 538 (1974)), and cross jurisdictional tolling, the court noted that when each homeowner’s cause of action arose depended on when she or he knew or should have known of her or his cause of action. The relevant statutes of limitations began, at the earliest, when the defect manifested itself in some way in the homeowners’ homes or when the homeowners should have known their properties were built using defective drywall. As a result, the homeowners whose claims were not tolled by the pendency of a class action under the American Pipe doctrine, will need to prove eventually that they neither knew nor should have known of their causes of action sufficient to satisfy their respective jurisdictions’ discovery law. This is a highly fact-based inquiry which the court determined was not appropriate for a motion to dismiss. As a result, the court denied BNBM’s statute of limitations motion as premature. Louisiana Product Liability Act. The court agreed with BNBM’s argument that the Louisiana homeowners’ claims were barred by the Louisiana Product Liability Act (LPLA). These claims for strict liability, negligence, and negligence per se were not viable as independent theories of recovery outside of the LPLA framework. 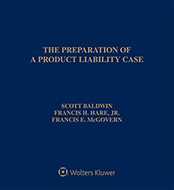 The LPLA provides the only theories of liability for manufacturers for damage caused by their products in Louisiana. The statute explicitly excludes amounts recoverable under redhibition for damage to the product and other economic loss except for recovery of the value of the product. Since the LPLA does not apply to non-Louisiana homeowners, the court did not dismiss the non-Louisiana claims for negligence, negligence per se, strict liability, express or implied warranty, private nuisance, and unjust enrichment. However, the court dismissed non-Louisiana homeowners’ claims brought under the LPLA. Breach of warranty and other claims. The court concluded that the Louisiana homeowners’ breach of the warranty of fitness for ordinary use actions were precluded by their redhibition claims. The court explained that a redhibitory defect is one that renders a product "useless, or its use so inconvenient that it must be presumed that a buyer would not have bought the thing had he known of the defect …." Similarly, an item is not fit for its ordinary use when the seller knows how the buyer intends to use it, the buyer relies on the seller to select it for that use, and the thing sold does not fit the buyer’s intended use. Based on Louisiana statute, the two causes of action cannot be brought together. When the thing sold is not fit for its ordinary use, even though it is free from redhibitory defects, the buyer may seek dissolution of the sale and damages, or just damages, under the general rules of contract. Finally, the court dismissed consumer protection act and private nuisance claims as the homeowners did not oppose BNBM’s argument that they failed to state causes of action under either theory. The case is No. 2:09-md-02047-EEF-JCW. Attorneys: Lynn C. Greer (BrownGreer PLC) for Lynn C. Greer. Russ M. Herman (Herman, Herman & Katz, LLC) for Plaintiff. Phillip A. Wittmann (Stone, Pigman, Walther, Wittmann, LLC) for Homebuilders and Installers Steering Committee. Judy Y. Barrasso (Barrasso, Usdin, Kupperman, Freeman & Sarver, LLC) for Insurer Steering Committee.